Article by http://greenwood-carving.blogspot.com how the Japanese use waterstones for sharpening: "Did you ever see a better sharpening set up than this? The water trough has running water fed from a stream so is continually flushing away the swarf and slurry from the stones. 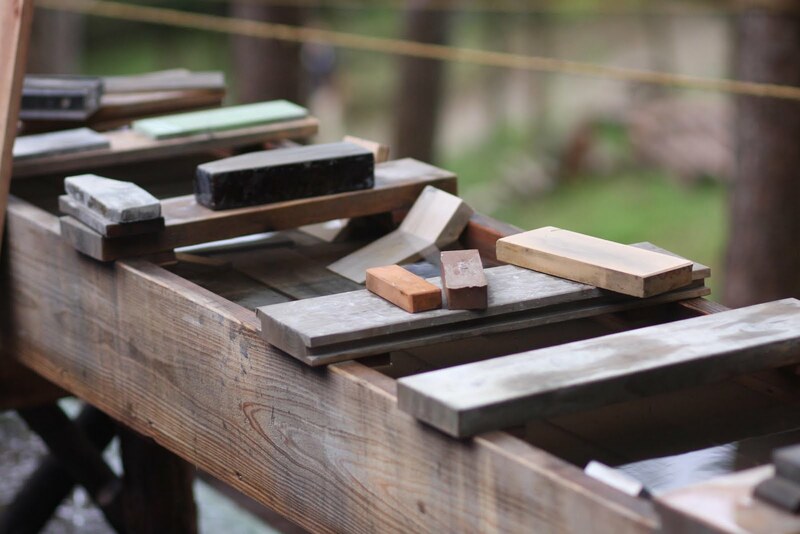 This sharpening trough was set up on the edge of our tea house worksite in Japan and the Japanese carpenters would visit regularly to keep a perfect edge on their tools. I have been sharpening with waterstones in the UK for many years but I learned a lot from watching and working at this sharpening trough. Most folk in the UK soak the stone and then just splash a little extra water on the surface, the running water below the stones allows the Japanese to continually sloosh water over the stones keeping the surface very open. The other big differences were the different brands of stones which cut much faster and they continually cut back the surface of the stone with a big diamond dressing plate thus exposing fresh abrasive and flattening the surface. 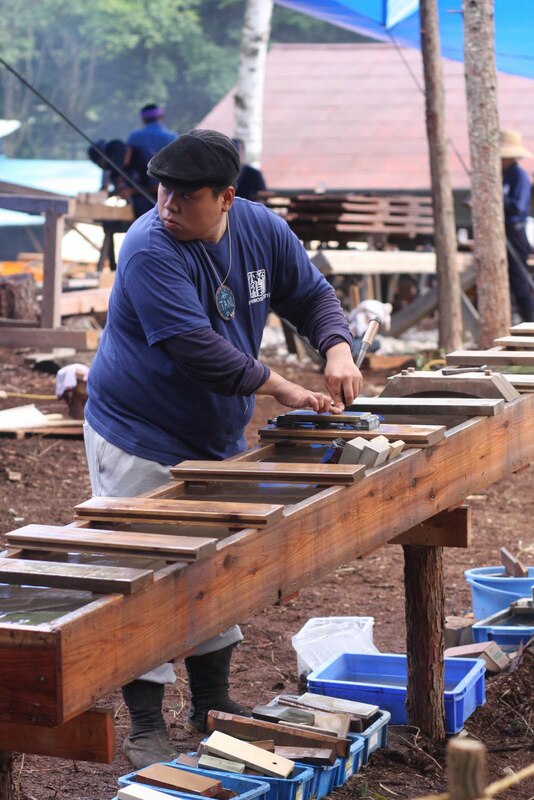 This means the stones are very much seen as something that has a limited lifespan, like an abrasive belt on a grinder but as the stones wear thin and break they become useful as slip stones, these too are flattened regularly on the diamond plate, here is Tak honing his chouna blade with a small piece of waterstone, note the wooden bucket of water to keep the stone slooshed. other differences are they have lots of stones and choose whichever ones are appropriate for the job, coarse ones for renovating chipped of damaged edges and lots of medium to fine ones for honing then extra fine stones for finishing. Most finishing stones were natural whilst most coarse and medium stones were man made. The skill level of the Japanese carpenters was impressive, they have all put in many hundreds if not thousands of hours sharpening with waterstones and so it is completely second nature, their hands just do the job without any thought, here is Tani. I was surprised how much pressure they use too, the trough is very secure and they press down hard and cut very fast. 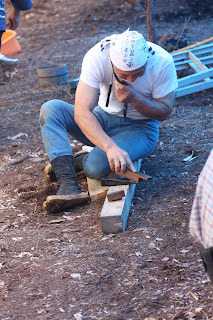 Sharpening a plane blade on three grits of stone would take maybe 4 minutes. 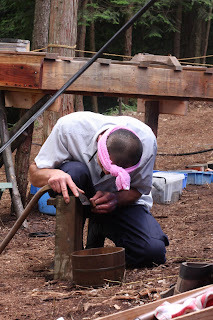 And here is hewing master Amemiyasan, whilst sharpening his axe his phone went off so he answered it and carried on sharpening without interruption. He is using a small piece of broken waterstone which has been glued on to a piece of wood, this is what they tend to use for axes. Often they will glue thin and fragile waterstones to a wooden board too allowing them to use the whole stone down to the last mm. Nicola made this is a short video whilst in Japan showing finishing a plane blade on a natural waterstone, note how the edge is washed and then he feels to check all the bur is removed. Through practice they are tremendously sensitive to this and can feel tiny burs that I need strong magnification to detect. 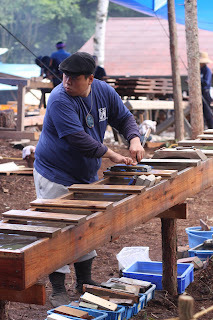 Also note the stone is washed and put away, the Japanese are very tidy and they want that stone to be ready to use next time. Japanese tool sharpening from Nicola Wood on Vimeo. At the Kesurokai event in Germany 2005 the Japanese carpenters did all their sharpening squatting on the ground like this. This position allows a lot of pressure to be applied, no water trough here but they kept a bucket handy to sloosh the stones and a gardeners spray bottle to keep the surface flowing. Hannes my German friend spent 2 years as an apprentice to a master temple carpenter in Japan and when he came over and helped me build my new timber framed woodshed he also gave us lessons in sharpening with waterstones. Hannes ran sharpening courses with our friend Michail Schutte in Germany last year and I think they plan to do it again. If there was interest I could ask him to come and run a masterclass in the UK in 2011. And now back to my own sharpening and how it has developed since Japan. 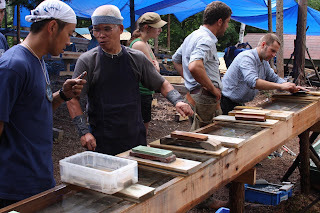 Before Japan I used DMT diamond stones (fine and extra fine) or power grinders (a tormek and a big belt linisher) for rough grinding and then waterstones only for the finer work from 6000 grit downwards. I now realise this is because the common stones in the UK are not so good at the coarse end. I have king brand 1000 grit stones but have never really got on with them, they are very soft and wear quickly so need continual dressing but despite that they do not cut very fast. 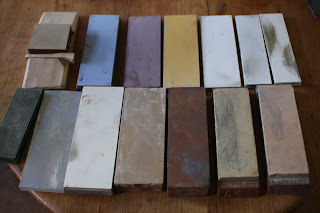 I now have some Shapton stones, a 1000, 1500 and 5000 which cut at around twice the speed yet do not wear as fast, they cost twice as much but for me they are worth it because it makes the difference between a stone I use and one I don't. I also bought in Japan a big diamond flattening plate to dress the stones, I did this before with my DMT diamond stones but this plate is bigger so trues the whole surface better and is coarser so cuts faster. Here are some of my current stones. From the top left natural stone about 12000, shapton 1500, shapton 5000, shapton 1000, shapton glass stone 16000 (yes really 16,000) spyderco fine stone, spyderco extra fine. 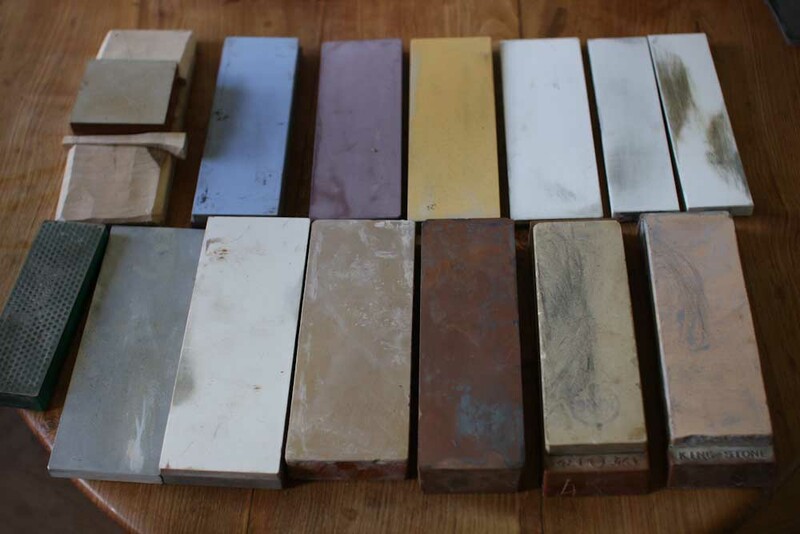 Bottom row, DMT extra fine, Japanese diamond stone dresser, unknown stone very like a shapton 1000, natural stone c12000, king 1000, king 4000, king 6000. Of these stones the shaptons are far superior to the rest, the king 1000 is barely worth having, I would just as soon use emery paper stuck to a woodblock, the king 4k and 6k are reasonable stones, in fact the 6k makes a decent finish stone at not too high a price I always finished with autosol metal polish on a board after this stone. Now I follow it with the 12k natural and 16k shapton instead. The spyderco stones are OK as fine finishing stones but they do not remove metal fast and have very little feel or feedback, the knife tends to skate on the surface as if on glass where even the 16k shapton feels like it is grabbing at the metal and cutting, this allows you to feel the bevel you are trying to sharpen much better.